1. 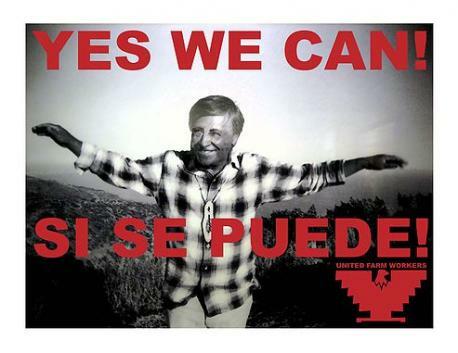 Next Thursday is Cesar Chavez Day (and my birthday). Do you know who Cesar is? 2. Chávez was born on March 31 in 1927. He was a migrant farm worker from the age of 10. He became active with the Community Service Organization, which helped fight racial and economic discrimination against Chicano residents. Chávez co-founded the National Farm Workers Association in the early 1960s. He focused attention on the plight of migrant farm workers and gained support to have his organization be the first successful farm workers' union in the United States. He used principles of non-violence, with strikes and boycotts. César Chávez remained president of United Farm Workers of America (AFL-CIO) until his death on April 23, 1993. Have you ever observed CC day, even if to recognize his efforts? 3. In California , from LA to Bakersfield & throughout the state, there are celebrations galore, from marches to fiestas, etc. Do you ever wonder who picks your fruits and vegetables? 4. If you are interested in more about Cesar Chavez and migrant farm workers will you investigate, even take a brief moment to recognize him next Wednesday?